Experiencing a vehicular accident can be a traumatic incident for anyone. Accident victims are sometimes surprised by the emotional and psychological distress caused by this event, which may in some cases be as debilitating as their physical injuries. For many of us, the most catastrophic situation would be to lose a loved one in an accident resulting from negligence of another party. In Canada, many thousands of motor vehicle collisions occur every year. Of these, Transport Canada reported that almost 2000 Canadians died in 2013 due to motor vehicle accidents. For those who are hurt, injuries range from those that are minor to severe injuries that have a permanent impact on the victim’s life. Accidents cause not only physical, emotional and psychological injuries to the victims but financial loss as well. Victims may find themselves dependent on their family for income. They may require short or long term medical care, and help with mobility and daily activities from family members or their community. Vehicular accidents can occur anywhere and can happen to even the most careful individuals. The most common causes of vehicular accidents in Ontario are drunk driving, distracted driving, and speeding. Vehicle collision reports indicate that the vast majority of collisions are avoidable with safe driving practices. In the past few years, the Goderich community has experienced its share of car and truck accidents resulting in injuries, loss of life, and heartache to families affected by these traumatic events. In May 2014, a man sustained life-threatening injuries when he was unable to negotiate a turn on a Goderich area road and his Dodge Ram pickup truck lost control and hit a hydro pole. In September 2014, a Ford Explorer crossed over to the oncoming lane on Highway 8 and crashed into a tractor trailer truck. The sole occupant and driver of the Explorer was killed at the scene and the tractor trailer driver sustained minor injuries. In January 2015, a driver of a mini-van died in a similar collision just north of Goderich while attempting to pass another vehicle. The driver of the oncoming pickup truck with whom he collided was fortunate to avoid injury in this collision, but it could easily been otherwise. Motor vehicle occupants are not the only victims of collisions in the Goderich area. In July 2015, a female cyclist was hit by a Volkswagen from behind while cycling on Blyth Road. As a result, she was thrown to a nearby field and sustained severe injuries likely resulting in permanent paralysis to her legs. The car driver was charged with failure to turn to the left to avoid the bicycle. Drivers are reminded that when possible, they are required to leave one meter between their car and a cyclist when passing, according to the Making Ontario’s Roads Safer Act legislation which became effective on Sept 1st 2015. When someone dies in any accident, family members are left grieving and sometimes have increased burdens, both financially and in terms of coping with day-to-day activities. When authorities determine that the fatality resulted from the negligence of another party, the term ‘wrongful death’ applies. Family members of the deceased victim may file a wrongful death claim against the party and their insurer, whose action resulted to their loved one’s death. 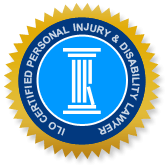 The Injury Lawyers of Ontario (ILO) law offices specialize in wrongful death claims, as well as other personal injury claims including slip and fall and motor vehicle accidents. The members of the ILO are all local firms that focus on providing representation to families of victims of wrongful death or those with severe injuries resulting from the carelessness of a person or company. If you have lost your loved one from a car accident or any other form of accident due to the negligence of another party, contact one of our lawyers immediately to help you seek damages for the loss of your loved one.